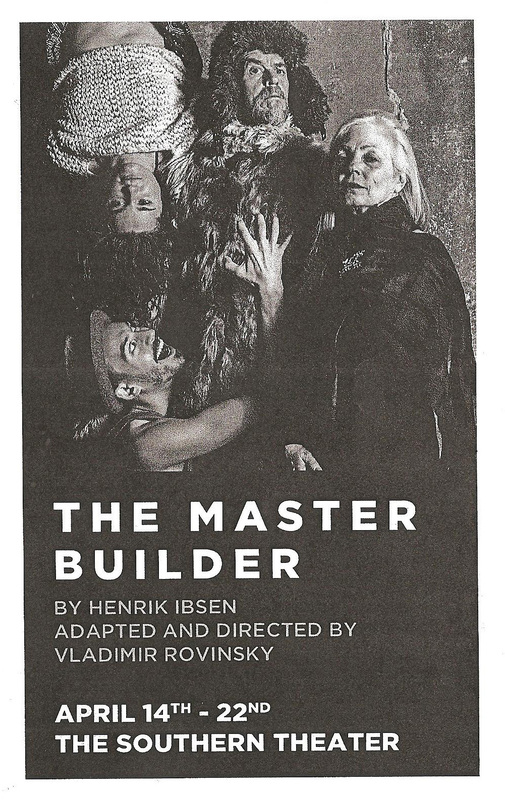 About Norwegian playwright Henrik Ibsen's play The Master Builder, Wikipedia says, "the search for meaning or interpretation has often engaged and bewildered critics all over the world." 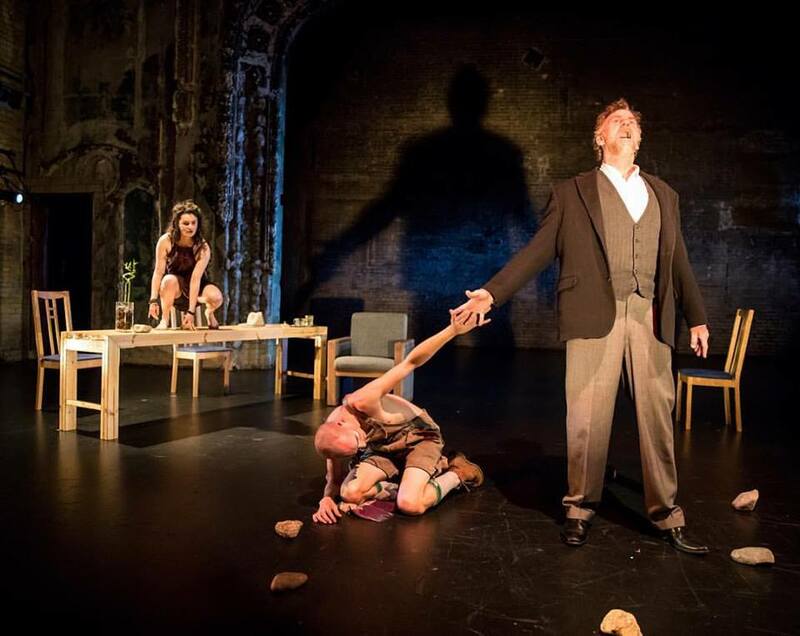 Consider me engaged and bewildered after experiencing Theatre Novi Most's new interpretation of the play, adapted and directed by Artistic Director Vladimir Rovinsky. It's so layered with symbolism that it would take a several thousand word essay to unpack it all, which I unfortunately don't have time for, as fun and challenging as it would be. And since it closed Saturday after a very short run I'll just share a few thoughts and observations about this engaging, bewildering, and gorgeous production. The title refers to an architect named Halvard Solness in a small Norwegian town. He's built a successful career (at the expense of his and his wife's happiness) but is reaching the end of it, and is unwilling to give it up to let the new talent come in. He also has a habit of preying on girls and young women, including office worker Kaia, who's engaged to aspiring architect Ragnar. Ragnar's father Knut, now old and near death, was once the master builder before passing it on to Halvard. The story takes a turn when a young woman named Hilda appears and reminds Halvard that when she was 12 or 13 years old, he kissed her and promised her a kingdom, and she's come to collect. But those are really just the bare facts of the play, the interesting part is everything in between. There's another character I haven't mentioned yet, a "troll" who seems to be perhaps Halvard's ego, or the devil on his shoulder, making him do things, or making things happen for him. 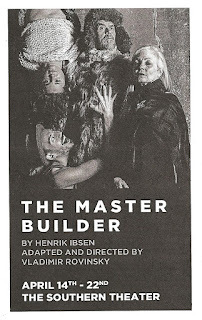 The curious and wonderful thing in this production is that the troll is not just an alluded to idea but a physical character, in the being of Alex Barreto Hathaway, who also ingeniously plays Kaia, Ragnar, Knut, and the master builder's doctor. He plays the troll like a cross between Cabaret's Emcee and Lord of the Rings' Gollum, neither male nor female, not even really human, with a guttural voice and animalistic physicality. Then with just the twist of a single scarf he transforms into one of the human characters with an entirely different physicality and voice. It's a remarkable feat to watch and utterly fascinating. 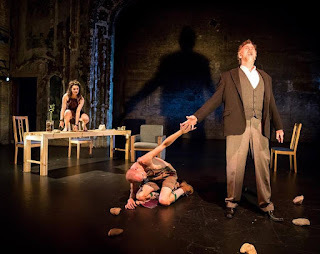 The human roles in the play are played by Pearce Bunting, terrific as the egotistical, mad, predatory, yet fearful builder; Barbra Berlovitz, elegant and serene as the builder's neglected wife, with a bit of the crazy about her too; and Shelby Richardson, fierce and fearless and a bit animalistic herself as Hilda. The design of this production is stunning, with no small thanks to The Southern Theater with it's gorgeously decaying walls. Heidi Eckwell's lighting design casts larger than life shadows of the characters on the back and side walls, in a very thoughtful way that emphasizes certain elements of the scene. I've only seen a few things by Theatre Novi Most, whose mission is to "combine the artistic traditions of Russia and America to create performances in which seemingly disparate ideas, languages, cultures and ideologies can clash, commingle, and cross-pollinate," but everything I've seen has been really unique and thoughtful and beautiful (see also last year's The Seagull). If you're looking for theater classics with a modern and innovative interpretation, check out Theater Novi Most. The character of Halvard sure seems like someone to be wary of. If you like classic theater performances you may like my interview with Chloe Bell who performed in "Servant of Two masters" earlier this month at the U of M. I'll be posting it tomorrow.